1. Pumpkin Compare & Contrast: Bring in a variety of pumpkins/squash (or look at pictures online). Then, have students describe and compare/contrast them. Similarly, you could pull up different renditions of Halloween monsters online and have students compare and contrast those. 2. Create a Spooky Story with Dice: Being a big fan of Rory's Story Cubes , I had to buy this set of Story Time Dice: Scary Tales . Each of the seven dice contains a different story element for a ghost story. What is nice about these dice is that they are polyhedral, i.e. have more than six sides/options. Each die contains a different element, and includes heroes, tools, settings, obstacles, twists, monsters, and endings. Did I mention that these glow in the dark? 3. Ghost Story Comprehension: Read a ghost story with your group - you can even turn off the lights and bust out some candles or flashlight to help the atmosphere. Then work on comprehension, asking Wh-questions about the story. You can get many Halloween short stories for Kindle for FREE on Amazon. 4. Haunted House Visualization: Pretend you are entering a haunted house. Have your students walk you through by describing the sights, the sounds, the smells... you can make a game out of this by taking turns adding the next sentence. 5. Halloween Synonyms/Antonyms: Come up with a list of Halloween-y words (e.g., scary, pumpkin, witch, haunted, gloomy, ghost...). Then, have students come up with as many synonyms and antonyms for the words as they can. I have a list of things planned for my students in the coming weeks. 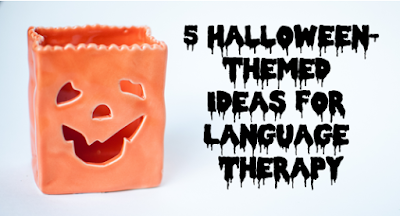 Stay tuned for more Halloween-themed speech therapy ideas and projects!